The tradition of removing your cap during the national anthem goes back much further than you think. “Ladies and gentlemen! We now ask that you remove your caps and rise for the playing of our national anthem.” Every baseball fan knows the routine, and probably knows it by heart. It’s the final formality before game time, and a sign of solidarity from everyone in the ballpark. Standing up during the national anthem makes it feel more ceremonious, but why do we have to take off our hats? We have a quick history lesson (we kinda have a thing for history) about where this tradition started and why we still do it today. During the Medieval period mounted warriors were honored with knighthood, a lower level of nobility. Knights were usually heavily armored for fighting, with just about every inch of them covered with protective metal. This included their faces, which were covered by a helmet. The helmet included a visor so that knights could raise it and see better when not fighting. During jousts, or when they were just out on the town, knights would lift their visor as a sign of respect towards ladies and nobility. That olden-times tradition has carried on through the ages and changed into removing your hat as a sign of respect. Fast forward a few centuries, and past a whole lot of military history involving saluting and removing or not removing your cap, and in 1998 removing your hat during the national anthem was added to the U.S. Code. There isn’t a penalty for not removing it, but it’s generally seen as a sign of disrespect. 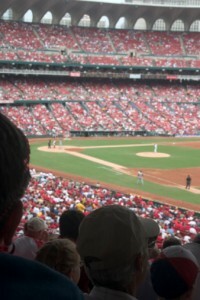 The next time you’re at a ball game you may notice that members of the armed forces in full uniform do not remove their caps, but instead salute. Look around during the national anthem this Fourth of July and you’ll probably see hats off and salutes all around. While you are here, please take a moment to browse our entire line of Baseball Shorts. And don’t forget, we also offer custom baseball shorts, perfect for travel teams, slow pitch softball teams, flag football teams, and more! You can also follow us on Facebook, Twitter, Google+, and Pinterest for more great youth baseball news, tips & tricks, and the newest designs from Sandlot Swag!